Whereas sculptings were used to capture the essence of organic objects, patterns were used to create toys of weapons, ships, or other mechanical things. Most patterns are wooden forms that are meticulously crafted to represent the final shape. All vehicles were patterned. All figure weapons were patterned. Most playsets like the Death Star, Cantina, Droid Factory, or other non-organic playset was patterned. For comparison's sake sets like Dagobah or the Land of the Jawas were sculpted. Patterning requires meticulous attention to detail in cases such as the Millennium Falcon or the Sandcrawler. Every small detail and protrusion seen on those vehicles was added by hand. Once the basic shape was established the pattern makers would begin the tedious process of adding the minute details. Bigger details would be made of wood and glued onto the main form. 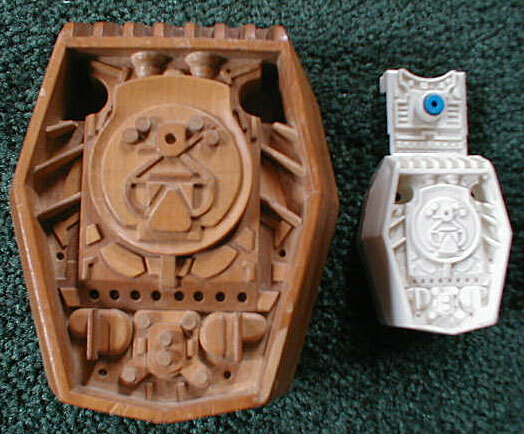 Very small details could be made of bondo and attached to the wooden form. To give an idea of the scope of a project such as this, it took Kenner pattern makers weeks of solid work to add all the small details on a ship such as the Millennuim Falcon. Often times patterns are created at a larger scale than the actual toy will be produced in. This large scale makes it easier for the pattern makers to do the detailing. Once the pattern is complete, an epoxy mold is made from it. Then from this mold, a urethane copy is produced. This final copy called the "tooling master" and it will serve as the pattern used for cutting the steel mold to produce the toy. The shape of the tooling master can be directly conveyed to a milling machine by a pantograph which also allows the scale to be altered as the steel is cut.